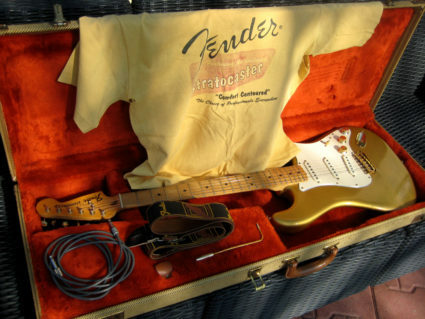 1982 Gold on Gold Stratocaster with original case, and all important whammy bar with gold tip. Plenty of marks/mojo! This is a player. All original as far as I can tell. Note that she carries the controls from ‘The Strat’. I contacted Fender, they told me this was quite possible. This guitar has the pickups and controls of Fender’s ‘The STRAT’ which means….. A hotter lead pickup (branded the X-1) with a much stronger output than the standard Stratocaster pickup (various X-1 pickups tested were between 6.0 and 8.5 ohms). *a new wiring circuitry delivering 9 different basic tones: a twin mode rotary selector switch replaced the bottom tone control which when used with the five-way pickup selector switch allowed not only for your standard 5 Stratocaster positions(tones) but also 4 “new” tones never before or since available on a Fender Stratocaster : neck and middle pickups in series – humbucking middle and bridge pickups in series – humbucking neck and bridge pickups in parallel neck and bridge pickups in parallel, with the middle pickup in series. Thus, the STRAT delivered nine (5+ 4) different basic pickup tones by combining the 5-position switch with the twin rotary selector tone knob. Otherwise the STRAT was fitted with the standard 250k ohm audio taper pots and the “master” tone control carried a regular .05 MFD capacitor. This unique wiring design delivers many tones not usually associated with a Fender Stratocaster and makes the STRAT one of, if not the most, versatile of any era Stratocaster produced by Fender prior to the recently introduced S-1 switching system. Just for your ears only! Here’s a link to a song I have been working on with ace songwriter Graham Evans. It’s a funky number entitled Alien Bride. We got Serge Baudot on bass. Andy ‘supawal’ Bennett on drums. Dr Gachet on brass, me on guitars. 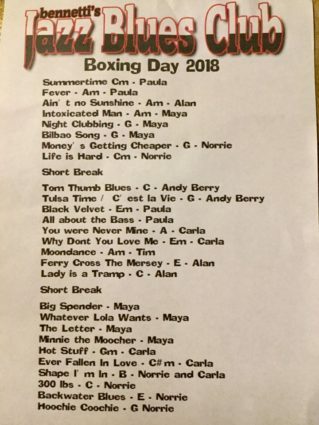 Last Boxing Day’s Jazz n Blues session was the last ever one run by me. I’d been running the monthly sessions for 5 years. It was becoming very time consuming, I felt I’d done my bit and it was time to quit. Boxing day was the Grande Finale. I stood there and told the packed house that this was the last one. I even had special souvenir posters done. 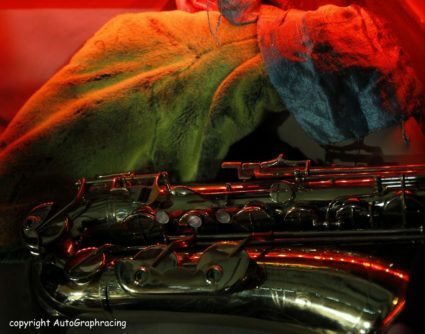 Some other musicians decided to take it on, and after a shaky start the sessions continued. But then when it comes to Boxing Day this year, they can’t do it……and can I help out because they don’t want to let people down!!! Searching through some old demo files, found this…. The Sugaree Band playing Rockin in the Free World. I always get a kick out of playing this. 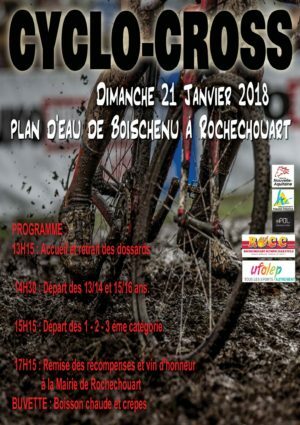 The ROC Cyclo club is organising it’s annual cyclocross race this weekend at Rochechouart….but it’s a new venue! For the first time ever the race will be held at the Plan d’Eau below the chateaux. I’m looking forwards to taking part, though not as a racer, as a helper/circuit builder/marshall/dog’s body. Should be great fun…. The end of a Jazz n Blues era! A HUGE THANK YOU! 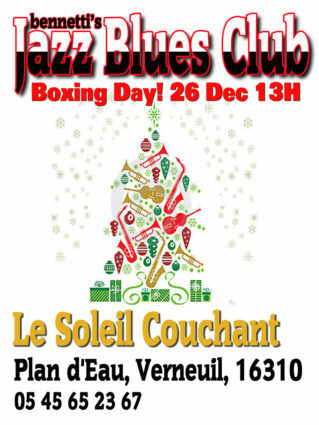 To everyone that came along to the Soleil Couchant yesterday for the final Jazz n Blues session. It was great, just great! I loved every moment. Here is a copy of the souvenir poster that I gave out….I wanted to share some of the moments from the last 5 years. I want to thank everyone who was ever a been a part of it whether as a musician, or a supporter. Thank You! THANK YOU! MERCI! DANKE JE! 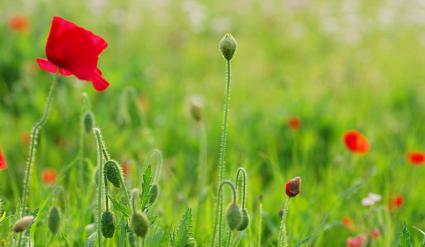 Here are the photographs of the day from ace photographer Ian Wilson. 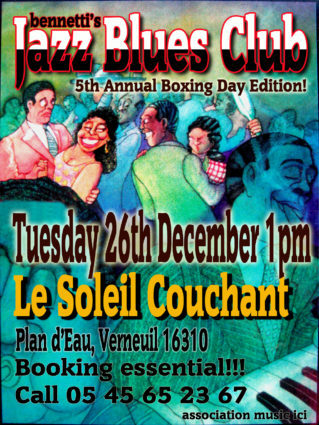 This Boxing Day at the Soleil Couchant starting at 1pm. 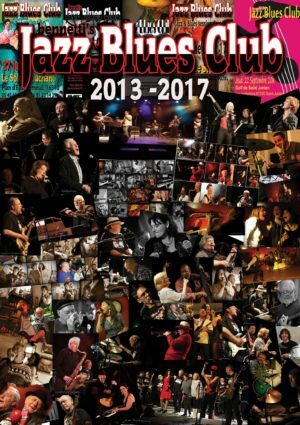 The last ever “Bennetti’s Jazz n Blues Club” session. This will be the 5th edition and the last. After 5 years I have decided to stop running these sessions. They are still as popular as ever, but they are a lot of hard work, and I have other things I want to give my time to.